Would you get upset if someone snuck around and ran an extension cord over to your house and started using your electricity? Who has to pay for that stolen electricity? You do, correct? Well that is what happens when someone hotlinks. A hotlinker sets up their webpage to display an image that is stored on another website. The hotlinker doesn’t use their own space to store the image or their bandwidth to show it – they leech off someone else. They steal. First of all, it’s just wrong. 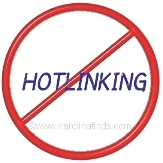 Hotlinkers use resources that don’t belong to them to benefit. Second, the hotlinker has no control of that image. The owner of it is perfectly within their rights to replace it with anything they want to as long as it’s legal. For example, someone hotlinking could rename the image so it won’t show up at all, or a cute kitten picture could be replaced with a pornographic image. Wouldn’t grandma love that? I’ve been nice so far – I’ve only replaced hotlinked images with new ones that state the image was being hotlinked from me my website address. One site is hotlinking to two of my images. I put the information together, made it into charts to make it easier for MY readers to use and put it into an article I wrote. During October, the two images were pulled from my hosting to be shown on someone elses website over 2600 times. I got no credit for it, no visitors to my site. That’s a lot of my bandwidth. That website’s visitors don’t enjoy my images and work anymore – I’ve changed the image. That’s a bad idea, not just morally but also in light of the Digital Millineum Copyright Act (DMCA). When the owner of the image finds it on a website , they can file a DMCA Takedown Notice with the webhosting provider. The person who took the image runs the risk of having their website shut down. These days even some forums are banning members who are hotlinking avatars. I try to use only images I create myself whenever possible, or if not, images that are in the public domain. I know how frustrating it is to have your work stolen. I’ve come across several websites claiming to be image search engines. Maybe they are, but they hotlink to the images on other peoples websites. At least one I’ve seen offers a download button, and most of them give the source code anybody would need to hotlink to the images themselves. In my opinion that isn’t just wrong, it’s irresponsible. Good image search websites, such as Google and Bing 1. don’t hotlink to the images and 2. when someone clicks on the image they are taken to the original location/website that has the image on it. These other sites, well, all they do is steal bandwidth from the site the image belongs to. Some do give attribution but they still steal bandwidth to show the images on their website. Hotlinking is wrong, don’t do it. If you see a graphic you want to use, contact the person it belongs to. They may give you permission to use it as long as it isn’t hotlinked, with or without attribution. (Attribution is giving the person who owns the work credit for their work.) Think about what you’re doing and avoid potential legal issues.